Don't let this tasty treat from New York intimidate you. 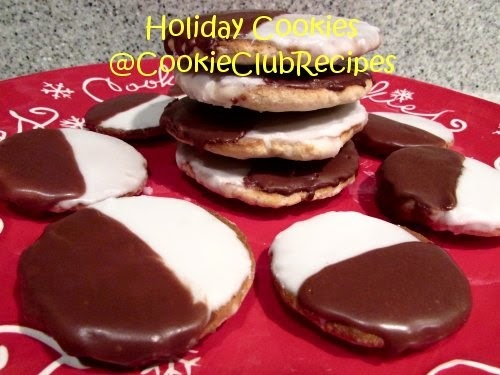 In my search to learn how to make Black and White Cookies, reminiscent of the ones you'll find in every deli, bakery, restaurant, and corner store in New York, I discovered there are a wide variety of recipes that have been shared over the years for the cookie, and, both sides of the frosting. So, I reached out to our Cookie Club members and got help from Ann, a native New Yorker. Like she says, they are a basic sugar cookie with special frosting but they do vary depending on what part of the state you are from, and who is making them. 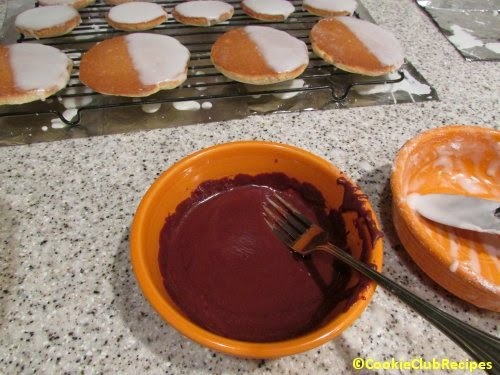 In our recipe below, I've slightly changed a few things (from her original recipe by King Arthur Flour), added several icing options, and as always, included several tips and step by step photos to make your Black and White Cookies a baking success! Note: These cookies are made in two sizes, giant and mini. I like both, so I made both. Family says the bigger cookies are better; more cake-like as the Black and White cookies from New York. Either size is wonderful for holiday gifting. 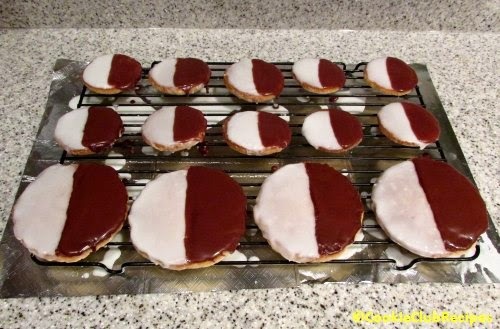 Note: Black and White cookies are frosted on the flat bottom of the cookie, half white and half chocolate. 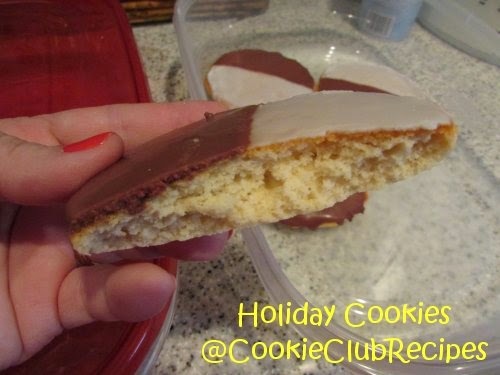 Whichever icing you choose, mix the confectioners' sugar with wet ingredients as listed below (boiling water, butter, and/or yogurt), then immediately divide icing in half, leave one half white (adding more confectioners' sugar to thicken) and add desired chocolate to the other half (melting in microwave for about 30 seconds). Continue reading for more tips. In a large mixing bowl, cream together butter, shortening, and extracts. Add sugar, then eggs one at a time. In a separate bowl, gently whisk together flour, salt, baking soda and powder. Set aside. In a measuring cup, stir together sour cream and milk. Add dry ingredients and milk to cookie dough, alternately about 1/3 at a time. For giant cookies, use a 1/4 - 1/2 measuring cup to scoop dough onto lightly greased baking sheet (or line with parchment paper). About 2 - 4 cookies per baking sheet, they will spread during baking time. 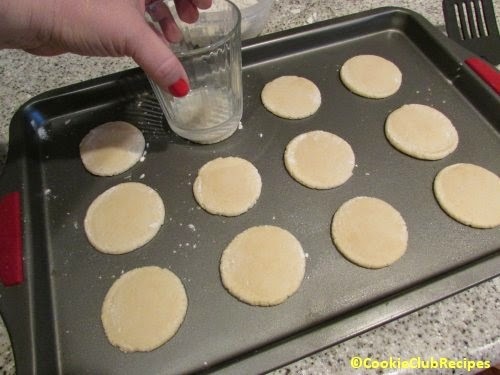 Flatten cookies with bottom of glass dipped in flour. Tip: Smooth edges of flattened cookies with end of spatula if needed. 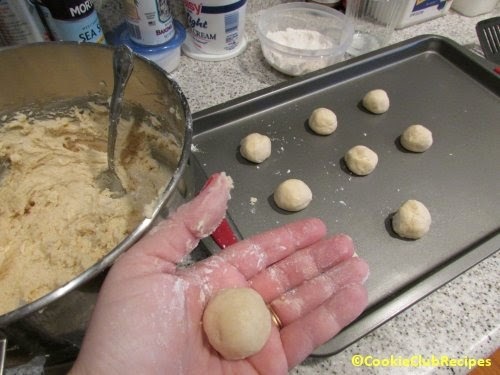 For mini cookies, lightly flour hands and shape dough into regular sized cookie balls, place on baking sheet and flatten as above. 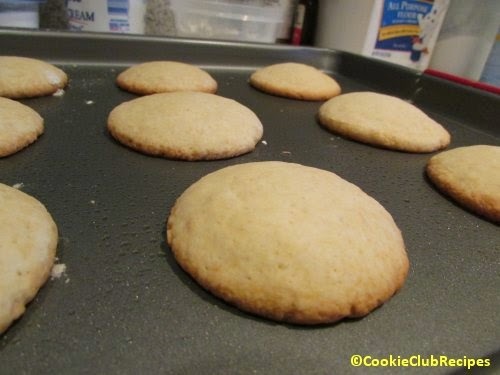 Tip: Here's where the mini cookies are slightly easier to make; more per sheet, and perfectly round. 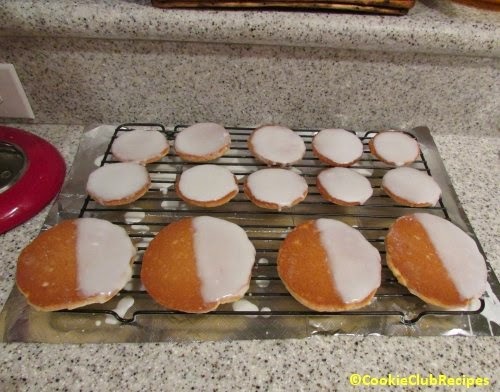 Bake 10-12 minutes, or until cookies are slightly brown around the edges. Tip: Do not overbake. Cookies should be crisp on the bottom but cake-like inside. Cool cookies for about 5 minutes on rack, then cover lightly with foil or transfer to sealed bag/container to keep them soft. Let them continue to cool for at least an hour before frosting. Tip: The original recipe from King Arthur Flour recommends covering the cookies with a towel, after the five minute cooling to keep them soft. The Cake Boss (Buddy Valastro) prefers to freeze them overnight. Though it is not necessary, you can do this if you want and make them ahead of time. Great tip for holiday baking! 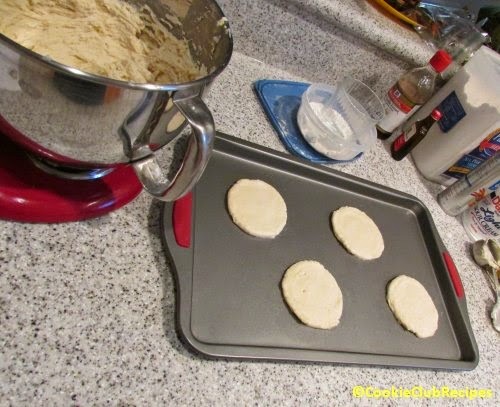 Place cookies with flat bottom side up on cookie rack. 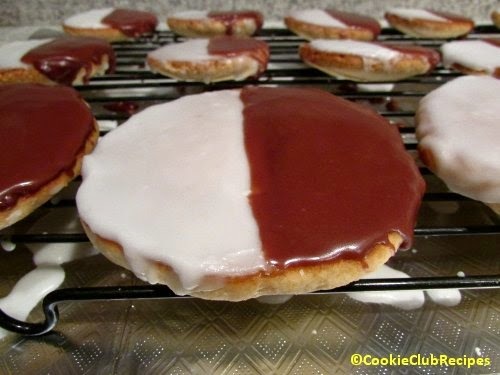 Spread one half with white icing and the other half with chocolate icing. When iced cookies are cooled and hardened a bit, coat ONLY one half side with the chocolate frosting. 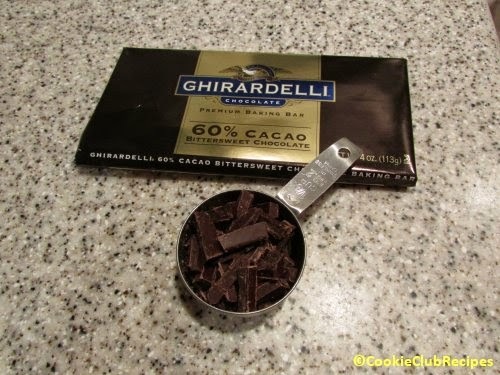 Tip: Repeat if necessary to achieve a smooth and thick coating of chocolate as well. Forgive me whenever I call this icing "frosting", for it really is icing, and not frosting. They are also lighter in this photo; the chocolate side is actually very dark as it should be with bittersweet chocolate. See what I mean. Dark chocolate. Sometimes my camera has a mind of it's own. Whatever icing you use, please do not use regular cake frosting for these beautiful cookies. 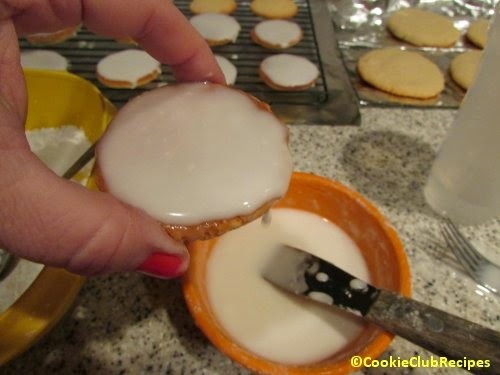 The icing should be smooth and crisp when finished.